Particle-scale characteristics govern the behaviour of particulate materials at the macroscale. An important factor that dominates the interaction of individual particles is shape, which generates particle interlocking. This affects the contact force network and the particle motion which lead to change in rheology, as well as stress distribution in the granular system. 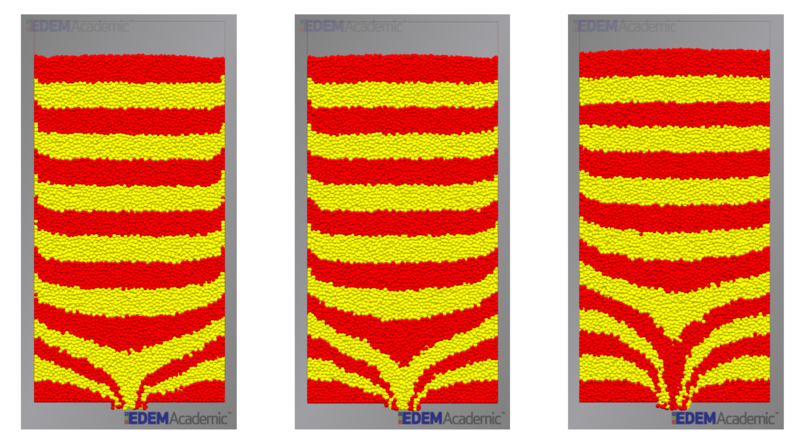 We consider Discrete Element Method (DEM) simulations, together with direct shear and silo discharge experimental tests, to determine the influence of particle shape on the mechanical response of granular assemblies at the micro- and macro-scales. Spheres are usually used for describing particle shape in DEM, due to simplicity and computational cost. In reality, however, particles are mostly of irregular shapes, which increases degree of inter-particle interlocking among the particles. Controlling rotation (i.e., use of rolling resistance models) can overcome the lack of geometric interlocking for the spheres. A part of this project focused on the effects of two rolling resistance models on both packing and discharge characteristics of spherical particles. The results suggested that, in case of silo discharge, use of rolling resistance models can partially follow the influences of non-spherical shape particles. There exist other approaches to simulate shape. Two widely used approaches, “Multi-spheres” and “Superquadrics”, are employed and the influence of changing particle surface and edge complexities on the micro- and macro- scale response is assessed for several test cases . B. Soltanbeigi, A. Podlozhnyuk, S.-A. Papanicolopulos, C. Kloss, S. Pirker, and J. Y. Ooi. DEM study of mechanical characteristics of multi-spherical and superquadric particles at micro and macro scales. Powder Technology, 329:288 – 303, 2018. Inﬂuence of including rolling resistance on ﬂow proﬁles of spherical particles. Dependence of angle of repose results on particle surface characteristics.